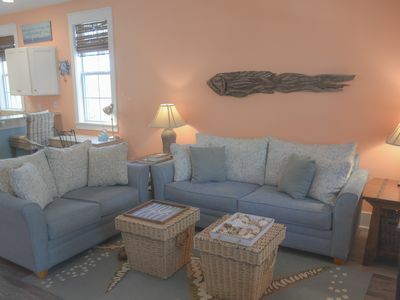 Our comfortably furnished beachfront townhouse is perfect for a romantic getaway or a peaceful family vacation. 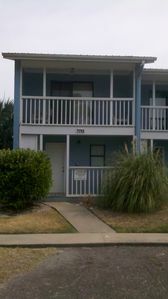 We are a 2 bedroom, 2-1/2 bath unit which has a 6 person maximum limit. We provide beach chairs for your convenience. The master bedroom has a king size bed and the second bedroom has a queen size bed. There is a queen sleeper sofa on the first floor. We are one of 12 units that share a community pool. 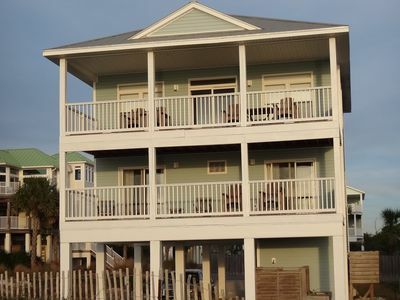 With great views from both the first floor screened deck or the master bedroom screened deck enjoying your morning coffee while watching the shrimp boats and dolphin from one of the beach front decks. It is quite peaceful and exquisite. 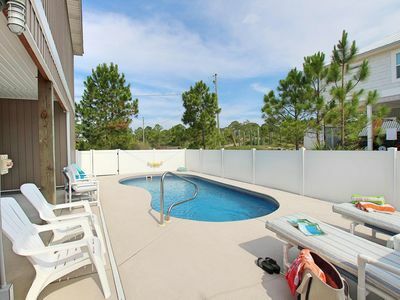 Only 50 feet off a beautiful secluded beach you have a clear view of the Gulf. 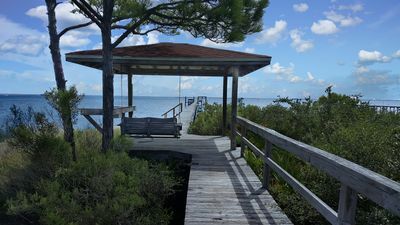 Features include boardwalk to beach, beach bonfires allowed (when fire ban not in effect, check with Gulf County prior to bonfires) and a pool. We are a short walk to the Money Bayou which is loaded with crabs. Enjoy the afternoon catching crabs for dinner. 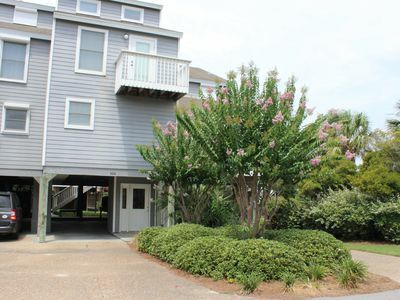 With 12 units and being the only multi-unit complex in the area you will find the beach secluded and private compared to Barrier Dunes with 190 units (only 15 with Gulf view) or Barefoot Cottages which are not on the beach at all. 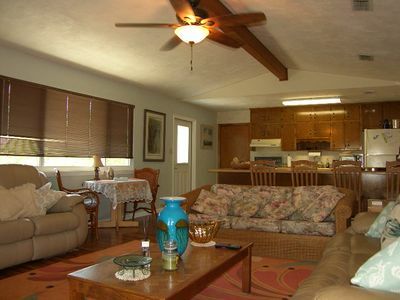 The Grounds: Exiting from the living area is a screened deck with a patio table and chairs. There is also a Weber charcoal grill just out the back door. The pool area is about 50 feet from the unit. There is a gazebo by the pool and a boardwalk to the beach. There are 2 outdoor showers. Bonfires are permitted (check with county first in case there is a fire ban) on the beach for a cozy campfire. 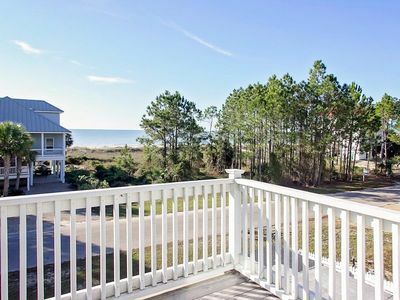 From long walks on the secluded beach, shelling, exploring the beaches, fishing, playing or swimming in either the pool or Gulf of Mexico it or just relaxing on the beach with a good book. 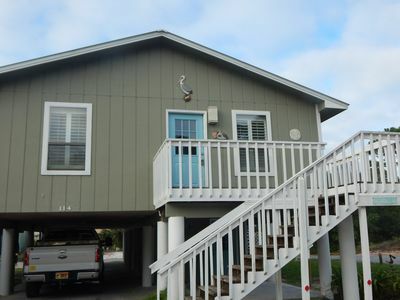 There is also plenty of parking right in front of the Beach Bungalow. Bringing the groceries and suitcases from the car to the house is a breeze. 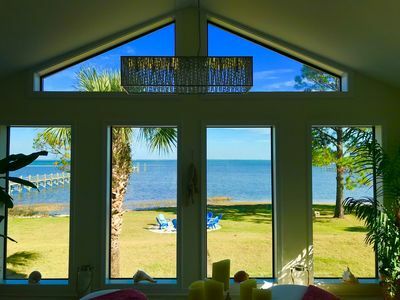 Enjoy the great door by visiting St. Joseph Peninsula State Park with miles of white sugar sand, this park has one of the top rated beaches in the United States. Sunbathing, snorkeling, and swimming are popular activities along the Gulf of Mexico and St. Joseph Bay. From offshore, canoeists and kayakers can take in a superb view of the high dunes and sand pine scrub. Outdoor enthusiasts can enjoy fishing, hiking, and bicycling. As a coastal barrier peninsula, St. Joseph provides excellent opportunities for bird watching; over 240 species have been sighted in the park. A boat ramp is located at Eagle Harbor on the bay side. You may enjoy visiting St. Vincent National Wildlife Refuge. The refuge is managed to preserve, in as natural a state as possible, its highly varied plant and animal communities. St Vincent has a large variety of exotic and endangered wildlife. There are ten separate habitat types have been identified: tidal marsh; freshwater lakes and streams; dunes dominated by live oak/mixed hardwood understory; scrub oaks; relatively pure stands of cabbage palm; and four different slash pine communities, each with its own unique understory species. St. Vincent is an important stop-off point in the Gulf of Mexico region for neo-tropical migratory birds. The island is a haven for endangered and threatened species, including bald eagles, sea turtles, indigo snakes, and gopher tortoises. Wood storks use the refuge during their migration. In addition, the refuge serves as a breeding area for endangered red wolves. You can get there by boat or ferry. Cape Villas has many activities to choose from within a 30-minute drive. Nested between Port St Joe and Apalachicola, there are many restaurants, activities, and shopping. 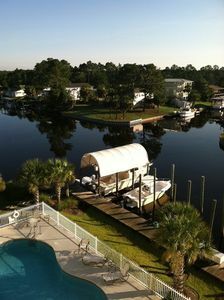 There are also places nearby that rent boats and personal watercraft (Jet-Skis). Panama City is about an hour drive offering many activities (from miniature golf, theme parks and movie houses). Our place is beautiful and is in an idyllic setting and we hope you have a wonderful time at our townhouse. Dolphins, Seashell's and Perfect Sunset's..AVAILABLE Jan and Feb 2019 ! The beach is calling.... few weeks left in Summer! Available May! 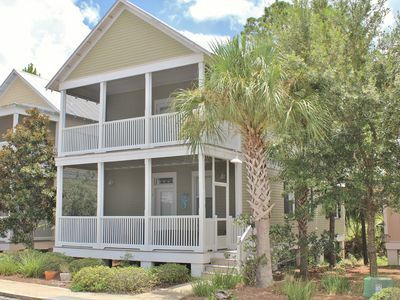 Shabby Chic, Pet-Friendly Cottage with Screened Porch located on 30A.